This time comingup with upgraded version of Supertrend indicator with sound and popup alerts. Here are instructions for those who follows Supertrend v2.0 to trade in a better manner. Installation steps are listed below. 5)Supertrend has two input factors Multiplier and ATR. default value is 3 and 7. Increasing the multiplier will increase the risk and decrease the profits. (Tested across all the timeframes). And lower multiplier values will results in more number of trades which means more commissions and more slippages.to pay. 6)Always start your trade when the past trades which you hadnt participated shows the worst. Don’t start once you seen the best best part of profits in Supertrend indicator. As the winning ratio is 42% it is not advisable to start your trade once you see the best results of any indicator. Wait for three or more consecutive losses to occur on the charts to start your trade after consecutive losses and not after consecutive winning on the charts. 7)Winning ratio is more or less between 42-45% across all the timeframes. (doesn’t includes brokerages and slippages). However most of the times higher time frame involves high risk in trading supertrend indicator. 8)Now the strategy supports Sound and Popup Alerts whenever there is a buy or sell signal in place. Time bar left functionality has been removed as alerts and non repainting features overrides the Timebar left functionality. 9)Supertrend V2.0 Strategy work only with amibroker version 5.4 and higher. 10)It is advisable to trade one or two symbols at a time. Avoid jumping from one stock to another which could sometimes lead to consecutive losses and even missing most profitable signals. 7)Bingo you are done. Now you will be able to see the Supertrend indicator with Buy and Sell signals. For watching Supertrend live visit your NSE live trading signals section. Commodity lovers can watch MCX trading signals here.If you have more concerns and feedback about trading this indicator comment below to get clarified. I’m using amibroker with global datafeed, i want purely intraday AFL code, so i want to trade in futures segment only. I want to do automated trading so please provide me AFL code. For sample intraday strategy prototype visit Simple EMA Crossover Intraday Strategy – AFL Code . However you need programming skills to build pure intraday strategies based on the prototype. Does it works for Nifty Index?? @Dinesh it works good with all the Volatile Instruments especially with high beta stocks. I have just installed supertrend v2 afl code. I use datafeeder for real time data but it provides only nse/bse data. Kindly provide some afl code which provides both nse (cash & fno) and mcx real time data at a free of cost. Thank you very much for your wonderful gifts that you keep providing since 2007. Your efforts deserve many applauds. Yesterday I tried inserting Alertif functions and finally succeeded in getting email as well as other kind of alerts. I think this would help many from trading emotionally. Based on my experience, major amount of money is lost due to anxiety. Anyway now you have included pop-up alert. Surely it will be of great help to trading community. Thanks OSK. This is the requirement from many traders hope it would be useful for them. And future AFL codes will have option to enable/disable Popup and Sound Alerts. Yes it is one of main requirement of many, and if you can include Email Alert also it would prove to be highly beneficial. So please try to consider this request. Thank you and BTW recently you conducted a seminar. Are you planning for conduct any in near future? If not how about webinars? Would appreciate discussions on Email using ALERTIF function as it makes trading a lot better. Which coding language people using to write strategies on tradjngview website. Will this supertrend back tested to use in MCX base metals like Lead,Zinc etc. ?Already I am having Amibroker with RTDS and with your input I feel I can load this supertrend with popup. @Parthasarathy : It works good with any high volatile instruements. For MCX market is better to use 10min or 15min timeframe due to the extended nature of the market timings. Thanks for your great efforts. Supertrend works great for NIFTY Futures. I had a question. 1. Can I use the Supertrend on NIFTY options also ? 2. Can I follow the same rules and carry forward in case of Options also ? 3. Or I can square off position till the end of the day. It is advisable to backtest withs sufficient backfill information. Atleast 2-3 years of backtesting data is required. Since i dont have valid backtesting data for nifty options i cant comment on using supertrend in Nifty options. Yes supertrend is a carry forward strategy. For intraday you need to conver supertrend strategy to exit intraday and have to backtest accordingly. Can you suggest any back tested strategy for options? I got it and installed the supertrend with popup and will test it at 10/15min in the MCX base metals..Thanks for your guidance. I dont save MCX IEOD data. I have data only for current month contracts. Value rt provides 6month data and EOD data and it is good to backtest atleast 6month . is there no solution for it? Need info except Globledatafeed. Error is “variable entry used without having been initialized”. Please tell me if I am doing something wrong. 1- I prefer doing delivery base trading for max 3-4 days. Please tell if this is helpful to identify my pick or if you can suggest some other code. 2- By using Supertrend, How I can get the buy/sell signal generated for today EOD. 3- At last please tell me the use of popup and how I can use it. I have added the file as mentioned in include folder but don’t know the effect it’s going to make. I have downloaded Non-repainting supertrend indicator and trend magic from your site in this which is best for intraday for stock futures. I have started using Supertrend as a basic guide to Nifty direction & do the corresponding trades in Options (buy side calls or puts). Look at both 5 min & 15 min to take positions & exit. Would like something for a positional trading in Options? Any suggestions? Trying the supertrend with Pop up in Base metals of MCX with 15 mts time period.My obeservations are it is good during the high volatile phase than the flat periods (which mostly exists around 11 hours) trading.Kindly let me have your suggestion. @Parthasarathy : This indicator doesnt predicts the future rather it gives you less losses and more profits with a good risk reward ratio. And the risk reward ratio is higher in highly volatile environments. No technic can predict the future cource. Supertrend provides some lead to buy/sell thro’ pop’s @ of 40 to 50% sucesses .Regarding edging by buying in current and sell at the second may only balance the position but coming out from the trade only decide the profit or loss. dear rajendran, you are suggesting ‘always trade with two lots. book one lot at target lines’. If i booked one lot at first target. where should i book the second lot? at 2nd target or at exit point? Yes second one should be exited at the subsequent Buy/Sell signal. Thank you. Then booking a loss in a losing trade with two lots & booking one lot @ 1st target in a wining trade, is it worthwhile? Yes it is! Thats how money management works. The idea is to loose little by booking partial profits. Thank you very much. Understood your idea, but why three target lines? In case of Gap Up or Gap down or days with heavily bullish/bearish new one can use the second or third lines as target lines to book partial profits there. Dear sir thnx for ur work.. can u plz give me any idea about A mibroker ..i want to install .. The popup with sound is very useful . But it works for the stocks with charts on the screen . Is there any way to get the popup with sound for all scrips in the amibroker database when ever a buying/selling opportunity occurs…. pl give the afl code for this…. Can we use this Supertrend AFL for exploration also? Currently super trend is not configured for performing exploration. You need to do your homework for implementing exploration with supertrend. Error is “variable entry used without having been initialized”. Can this AFL be used to take positional trades in Stocks? or it should only be used for Index futures? Can u pl suggest the settings to be used for Supertrend afl for Nifty Future on 1/3/15/30/60/75 mins/Daily/Weekly time frames? your suggestion is required how to calculate exect box size of renko . Dear Rajendran, In a 5 min chart, the signal frequently changes, is there any filter for reducing whipsaws? Do a backtest and if it provides decent level of risk and accepted level of risk involved then you can go it it. Sometime back you have published regarding importing of ITM Financial Signal into GCI MT4 . Could you please give the link -- it will be helpful. Sir, i daily watch your web site since more than 3 years. plus you send the market day to day coverage in detail of trading information through email. i am confused how to go about with AMIBROKER’s that is minimum how many days BACKFILL is required . eraldo, he left out the \ but it is C:\Program Files\AmiBroker\Formulas\Basic just copy files to folder, close then open AB then insert into a chart and you will see. Does Super Trend works good in EUR/USD or Forex Pairs ? what time frame ? It doesnt works in longer duration markets. Longer the duration of the market more complex your strategy should be to lock into profits. A simple Trend trading never works in 24x5 forex markets. Dear Sir, I’m a new comer on market and lost 5lac in a year. now i am looking to start trading with technical analysis software. please provide me your valueable informations about which and where i can get the best software. Your Losses and Profits doesn’t depend upon the trading software used. It depends upon the discipline and the logic used in your trading decisions. Software play only a minor role in providing edge in this market. Can the supertrend indicator be used for trading USDINR on NSE? If yes what are the best parameters to get best results? I am a trader and a customer of Unicon Securities where they use NEST application, so my question is can we connect NEST to Amibroker and trade from there. If yes then please consider this as a request and send me the procedure how we can link NEST to Amibroker please. Yesterday I commented on this Venu’s query but it is not published. Probably the spam system blocks your content if you try to include more than two links. I have not got any reply from you or from OSK again. Please reply to my original request. can i have backtest report file for the live signal section for bank nifty and nifty futures? I have been using SuperTrend AFL with 12 Minutes time frame for a while, SuperTrend suits my trading style as there are less false signals when compared to EMA cross over type system and also trading in lesser time frame allows me to risk less. i.e 2% of my capital per trade. I have back tested Nifty 2008 to till date with Super Trend and returns are very good with 10/12 mins time frame. I have back tested with 5, 10, 12, 30 and 1 hour time frame. Out of all these 12 minutes provide good result with less no of trades. Without any discretionary interruption if we trade with discipline, in the long run am sure we would earn more returns using this system. here’s the back test result. Can u pl confirm the settings of supertrend used in backtesting?. If suppose some one intend to use the supertrend on 1/3/5/15/30/60/75 mins/D/W/M time frames, what settings of supertrend are suitable to use? Also how we can fine tune this settings by checking them through backtesting. Hi Kiruba, not able to find the backtesting results for 12 min in your attached file. I missed the 12 mins data in my previous link. i have uploaded again. here’s the link. From the back test result n trading experience i feel 10 and 12 mins Time frame works well for Nifty. hello sir the current value display of nifty or banknifty etc is going out side the right side of the ami window. any way very good one. My friend told me this strategy. 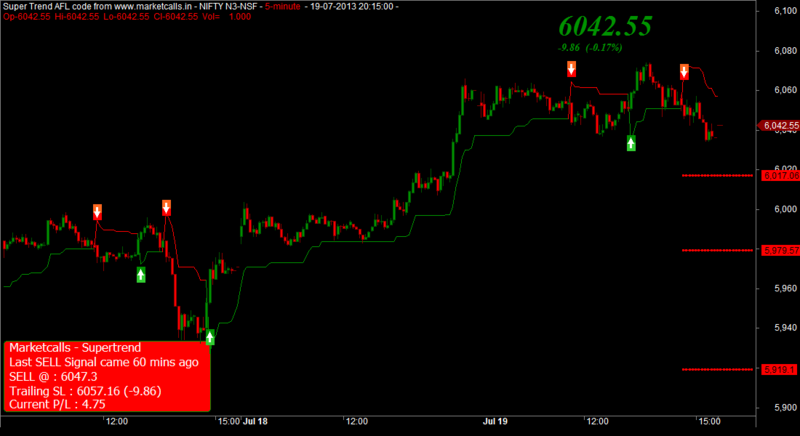 According to Supertrend, If daily is in BUY Mode, we should follow only buy signal in 5M TF and vice versa. Is this strategy more profitable compare to all Buy/Sell Signal on 5 M TF ? OR Any suggestion regarding this ?? thats right. actual point is to trade with lower time frame based on what the higher time frame says. if 1 hour chart in buy mode and when 5 mins chart gives sell signal, just exit the long and do not go short untill 1 hour chart says so. bcoz soon u may get a reversal in 5 mins. @Kiruba : Thats quite difficult. Its better to stick with one timeframe. Involving two timeframe never gonna work for trend trading. I want to fine tune Supertrend indicator according to volatility So What would be the parameters, if Volatility is between 20 to 30, 30 to 40 and 40 to 50 ?? @BhailalBhai : I request you to do your home work with volatility. Thanks for the Supertrend code.I m much interested in watching the difference between the super trend and intratrend.It ll be more helpful for me in study purpose if you could enable the intratrend chart for few days https://www.marketcalls.in/intratrend. Thank you for helping by creating very useful AFL call Super trend V2. I have added this to my amibroker. It works with popup alerts but sound is missing. Can you help me get sound alert too. First & foremost, many thanks for all the wonderful work you are doing. I have installed Amibroker 5.60.3 and Stock Live Data Feeder 2.9.0 and now copied the Non Supertrend AFL code ver2.afl. I can see the Supertrend indicator with buy and sell signals. But there are a few things missing: 1) Amibroker shows 2-days old data -- for e.g. on 28th Nov’13, it was showing data only till 26th Nov’13. 2) After applying the Supertrend indicator, I am seeing 3 horizontal green/ red lines after the indicator has given the last buy/ sell signal -- what does that mean? 3) How to calculate stoploss using Supertrend? Rajendran, thnx for SuperTrend with Popup. just facing one problem , once the popup starts , doesn’t stops and hangs the Ami’s Parent screen. plz help to get rid of this problem. This is great. Thanks for sharing. I had one question though. What all changes are needed to use this for longer duration’s? Is there a non intraday version for this. Non Intraday Version? What do you mean by that? Thank you Rajendran for Supertrend with Popup. just facing one problem with popup, once it pops up, doesn’t stop and so the parent window hangs. Any Solution? Anil that issue is there in some machines. Next version of Supertrend the problem will be solved. I’m Nair from Indonesia. I am using MT4 for my trading. i can use this for my COMEX Gold ? How to calculate the stop loss when using this strategy in Nifty Futures…..
Am a long time viewer of ur website. very informative for retails traders…..really appreciate your help. how to adjust this …………( Am not a technical person..so my terminology is of lay man’s. hope u udnersatnd…but slowly slowly but able to alter afl/parameters with ur isntructions…like the one u gave above for this afl…( for moving the LTP inside the panal view from extreme right ). SO u can advice wat to do …get this sorted out..i will do it myself…if its very difficult u can upload the edited popup afl. One more thing, have you heard of ” Cumulative Delta analysis ” ..what is discussed in TradersHelpDEsk.com …is it possible to make a afl for amibroker with that method ? And buddy….plz understand….am a novice, so i dont have knowledge to experiment with coding…. i know its easier said than done…..but it is just a query to get my views cleared from you. All the best for your Seminars.. Cumulative Delta analysis is order flow concept and current amibroker doesnt support it. You can try with softwares like ninjatrader,market delta or multicharts. I was wondering if Super trend works anymore or if it is profitable any more. After the introduction of options at every 50 points instead of 100 points, I think the profitability of ST has decreased. Rajendran sir can you share the backtest results of ST from the Jan 2014 to present? Make Sure you are using Amibroker 5.5 or above. It doesnt works with lower version. hi sir i need clarification on back testing these parameters, when i applied on our super trend, it shows different executed price but not actual price given on the arrow of buy and sell, not even on the close price. Try to use a Quality datafeed and in the website we are using the parameters ATR=10 and Multiplier = 4. Check it out your default parameters could be different. Thankyou very much for making supertrent .. When can we expect Super trent v3 and also it be excited to see profit in last 5 trades displayed..
Can u kindly tell me about the target parameters used whn applying this afl on index options??? (1) How exactly I should tread with Super Trend indicator? I mean how many lots I should square off at 1st target? And how many lots at second & third target? (2) Where I should put my SL? (3) Can I use this strategy in multiple scrips in commodity? I mean in 14 -- 16 scrips at a time? (4) I am planing for auto trading. Can use Super Trend indicator for auto trading? (5) Can I have your mobile number? (Just in case!). Mine is 9604963870. Please answer my question kindly. By the way you are doing a great job! God bless you ! I am a Fx trader. Looked at your site and infos, very good. Rajandran,thanks for providing good info. Am currently using the Pitchfork, inverse correlation, want to use your super trend indictor for one more confirmation. I down loaded your Super Trend Indicator for MT4: I have the following clarifications. (1)	Not able to adjust the thickness of the lines—it stays with the dotted line. (4)	Guide me to the right super indicator to install in MT4. Can u please help me in reading proper buy signal & sell signal using your supertrend & how to generate profits from the supertrend in nifty futures only. As now a days there are more consecutive huge losses in compare to little profits. I have send one email at your support email id. I am requesting you to please reply. My query is -- By sseing the charts , How to determine if past trades have delivered consecutive losses ? Hi, This is Ajmal from India. Have come across your portal. Pretty impressive. I trade intraday in Equity and Commodity(mostrly in Crude). Can you please tell me how to use this super trend automation. I am using MT4. Your strategy is good. Golden mean. -- If trading is about beating time, how time constrained plays like intraday and fno help you win? -- How to tell, which higher or lower level cycles are going to take over? Great work done. very useful for someone who is new to Technical Analysis. Really appreciate your efforts which you render via marketcalls.in. My question to you is can this new version of Supertrend be used in Pi by Zerodha and how also if not what would be similar alternatives for the same. Can you write as a indicator for ninja? I would like to seek your help. whenever i trade in options i end up in losses. also whenever i carry forward my position the market behaves the oposite directions. how can i come over it. stop using supertrend for options.